Look at all of the things you can do for just one mana! It’s kind of incredible, really. This is where I spend a lot of my time in deck design. It’s important to me that I be able to interact in the early stages of the game, so I want the majority of my spells to cost three or less. One-drops are particularly effective, because you’ll quickly gain the ability to cast multiple spells in a turn and pull ahead right from the beginning of the game. Once I assemble a first draft of my deck, I usually have to spend about an hour paring down cards until I get to the ninety-nine card main deck I need. The reality, though, is that I agonize over what expensive spells I want to keep. 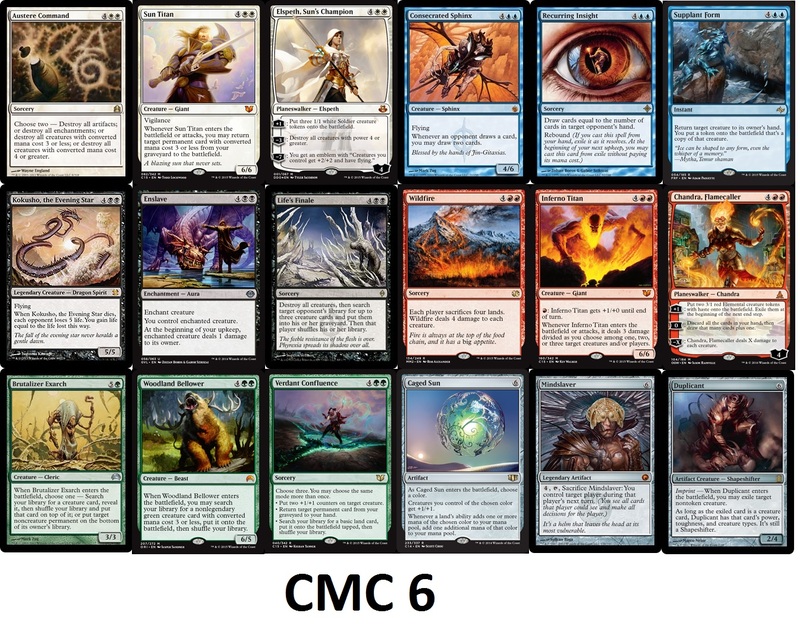 The six, seven, and eight cost cards are all highly variable, but the cheaper cards are pretty much locked in. 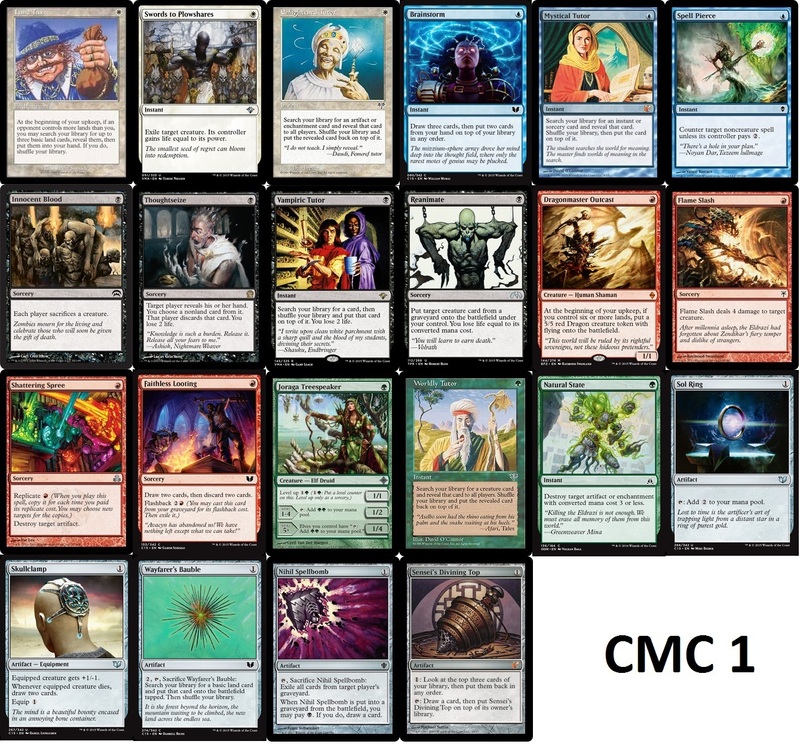 I know that I can’t have a viable deck without them, whereas Clone Legion will win a lot of the same games that Consecrated Sphinx will. As far as card design goes, these are all highly irregular. 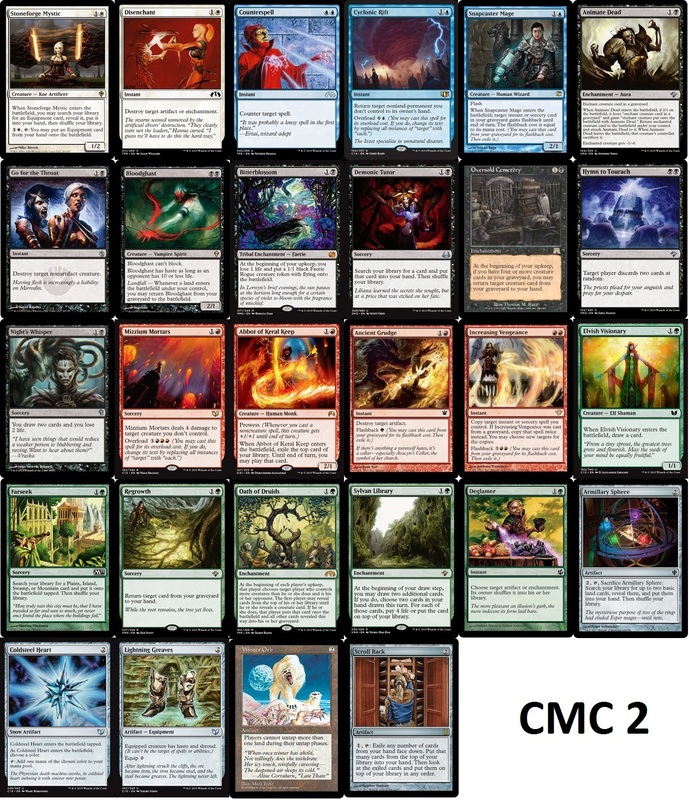 In modern sets you wouldn’t expect to see most of these cards, and certainly not more than one in a given set. Part of that is due to the decreased power level of spells; they just don’t make tutors like they used to. Another part is that some of these cards intentionally pushed the envelope. Flame Slash was not a breakout constructed card. It existed in an environment where Lightning Bolt was also legal and that’s just a much more popular card. There was also no reason to do a fourth damage. The relevant creatures you wanted to kill were Bloodbraid Elf, Sprouting Thrinax, Worldwake manlands, and Squadron Hawk. Where Flame Slash really shined was in Limited and it was shown to be so dominant in Rise of the Eldrazi draft that R&D has significantly backed off of the quality of removal in more recent sets. Two is where the real money’s at. Many of these cards are sufficiently powerful that they can swing games all on their own. Oath of Druids is a dominant deck in Vintage and it’s nearly so in Commander, as well. Demonic Tutor and Counterspell are the defining cards of the format. You have recursive threats, combo enablers, card advantage, key pieces of disruption, and answers for every type of permanent. Part of the reason that these cards are so iconic and beloved is that they somehow still feel appropriate to their cost. 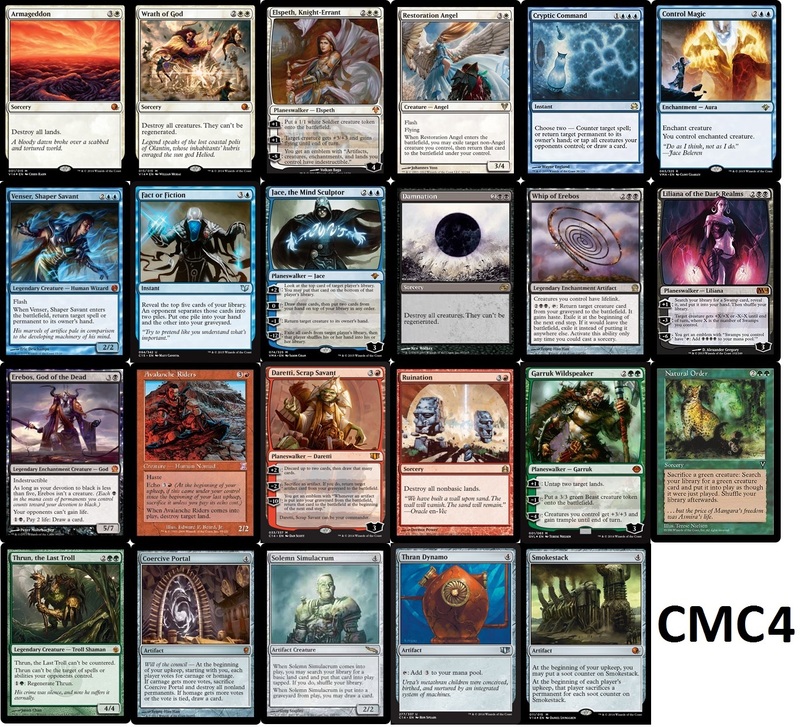 Demonic Tutor is way more valuable than any other two drop ever and–while it’s a good bet that most of these cards would not ever see core set reprint–none of them feel completely ridiculous, either. I said two was mostly fine. That’s because most of the truly broken cards in Commander seem to fall into the three slot. Timetwister, Necropotence, and Yawgmoth’s Will should probably just be banned. They aren’t fully legal for play in any other format. 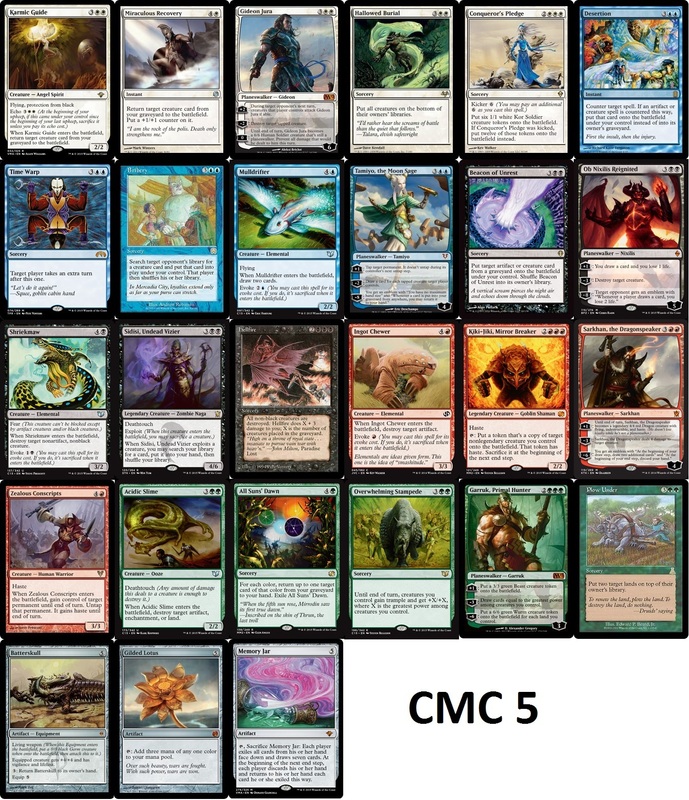 Beyond that, you have some incredibly potent cards that fulfill a variety of strategic roles: the best unrestricted removal spell, Council’s Judgment; the best mana-hoser, Blood Moon; and Red’s best removal spell, Chaos Warp. There are obvious design mistakes in this picture. However, there are also a number of cards that are still considered the nominal standard for modern designs. For three mana, White can get a creature with Double Strike or a removal spell with no targeting restrictions. Blue still gets unrestricted counterspells with some kind of added value. Red gets a damage-based sweeper. Green can get card advantage, usually with some choice of card attached to a body. Cards like these continue to see print even in the most recent Standard-legal sets. I take this as a positive sign, because we’re likely to get more great stuff just like this in the coming years. Even better, the power level for cards at this cost could continue to rise in the future. At four, we start to see a real breakdown in the correlation between cause and effect for the first time. The best four-drops aren’t that much better than the best three-drops. In fact, those threes are really only good because they were pushed a bit in design, with lower costs than would normally be associated with their effects. For me, four is all about adding value. You can do whatever you needed to for a cheaper cost, but certain types of effects let you really break parity if you can generate something extra. Take Control Magic, for example. Removing a threat is cool, but getting a threat of your own is extremely beneficial in a tight game where a 2-for-1 can be the deciding play. Sometimes the extra value is in the promise of future returns. There are quality planeswalkers in every color whose abilities mount an advantage turn-after-turn; something that isn’t true at any other mana cost we’ve talked about. Coercive Portal and Smokestack can offer the same, but with no color restrictions. At five, we really see the cost/effect correlation go off the rails. As a group, the fives are just plain weaker than the fours. The planeswalkers show no consistent increase in power to justify the higher cost. For creatures, this is particularly troubling. The threats here just aren’t consistently better than what you can find at three. This is why, as you’ll see, most players prefer to wait ‘til six for their creature threats. You have a 20% bump in cost that usually buys you a 50% increase in power, toughness, keywords, and added value. This isn’t to say that all these cards are worth less than I’d expect. The sorceries are the true standouts at five. Plow Under, Bribery, Time Warp, and Mind Twist (which I consider an honorary five) are all fully capable of ending the game immediately. The real difference in the design of expensive cards seems to be in their rarity. If something is expensive, that means one of two things: either the cost is inflated to drive down the power of the card, or the effect is splashy and will break a game open. 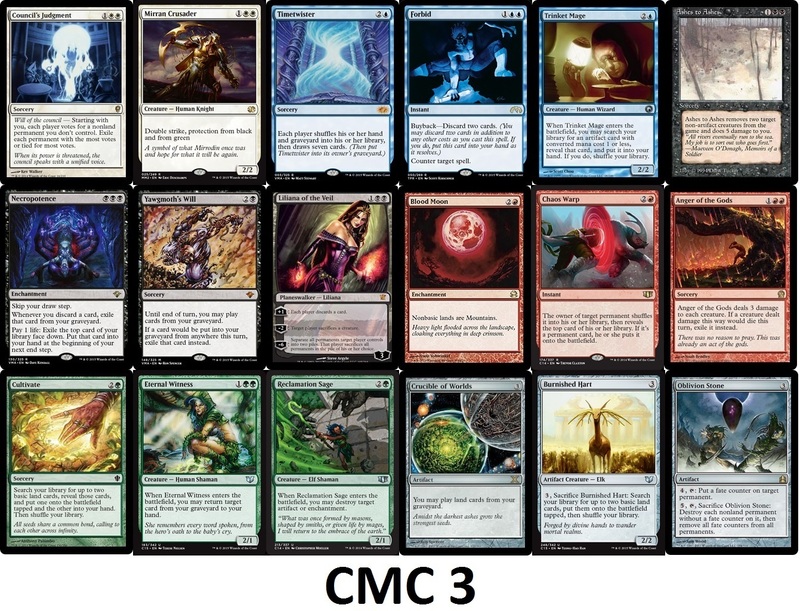 Commons and uncommons with a high converted mana cost tend not to make it too far in Constructed, but rares and mythic rares can often generate the extra oomph needed to justify their expensive price tags. This is reflected in the lower number of commons in my benchmark guidelines for costs five and six. For threats, this is where the meat is. We see high power values relative to the mana cost, usually two relevant abilities, and an emphasis on immediate value to help minimize the effectiveness of opposing removal. Both targeted removal spells pictured here are immediate 2-for-1’s. The mass removal spells provide some added value. Most of these cards can win the game on their own (some faster than others), but obviously the best are going to do it on the spot. Mindslaver and Wildfire prompt a high number of concessions. Making double-digit amounts of mana or drawing double-digit numbers of cards will likely result in a win on your next turn unless your opponent can act quickly to stop you. Every player has their own standard for what makes a good card. Here on the site you have heard other CommanderCast contributors talk about their own heuristics. Uncle Landdrops has his “Titan-or-bust” rule. What kind of card evaluation benchmarks do you use in your own decks? Share in the comments below, follow us on Twitter, Facebook, and be sure to support Commandercast.com on Patreon.